Why Do Children Bite and What Can You Do? Why Do Children Bite? A bite can be a painful experience and a safety concern. But did you know that when it comes to biting, it is actually seen as a normal phase in development for infants and toddlers? In fact, young children usually communicate physically before they use their verbal skills. A child that is pushing, shoving or biting may be trying to say something that they can not yet verbally articulate. Here are some strategies when dealing with a biting child. Children learn from cause and affect. You must react to the incident immediately. If you wait too long to manage the situation, you may risk the child not connecting the dots. Focus your attention on the child who was bitten. Make sure to console the child and administer first aid if necessary. Depending on the situation, you can have the biting child assist you to show them that they hurt their peer. Another option is to remove the biting child from this situation without providing any negative reinforcement or emotions. It is important if the child is acting out, that they are separated until they have calmed down. Caregivers should look for cues as to why a child is biting. There may be circumstances that prompt the biting behaviour such as trouble with transitions, the birth of a new sibling, teething or a move. Caregivers should understand that biting is a natural process just like potty training and tantrums. The trick is to foster and maintain a safe environment for all the children. Focus on teaching children to use theirs verbal communications skills to express how they feel. The consistent promotion of language can enhance cognitive development and could even minimize biting. For example, teaching a child basic words such as ‘stop’, ‘don’t’, ‘mine’, ‘no’ can help a frustrated child articulate how they feel. Also, caregivers can be specific in the way they communicate to children. Instead of saying, ‘You are being mean’, they can say, ‘You are hurting Sara’s feelings when you take her toys’. This way, the child gets a clearer picture and understanding. 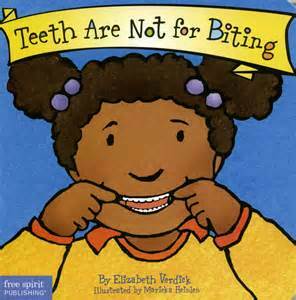 At Alpha’s Preschool Academy, we use these strategies as well as books such as “Teeth are not for Biting” to help the child understand through visual pictures and a story. For most children, biting is just another developmental phase that they go through. Helping the child to understand that biting is not right, fostering communication skills and educating the caregivers on how to deal with it can all help to minimize the number of encounters.